It might be desynching when the passengers decide to reroute, en-mass, due to backlogs. Although, I am not entirely sure where they really want to go. I really want to add about 500 pax ships throughout my lines, but this remains to be seen. Indeed, I should be adding at least that many to address growing backlogs... but afraid to add 500-1000 additional ships to the map. Waiting for 1829-1830 trains. Realistically, it's 1835 before trains are worthwhile in terms of speed (and the faster ones start becoming available in 1842). Can anyone confirm whether the desyncs are the checklist mismatch types under 11.26? Please can players refrain from reclaiming vast tracts of coastal land unnecessarily? Whilst a large number of my "no route" ships are due to schedules jumping to inappropriate waypoints, many were due to ocean waypoints suddenly becoming inland. The large area of new land around 540,612 was particularly troublesome as it was on a junction of a lot of waterways, several routes had waypoints there. I suggest we may need an extension request to make all in-game waypoints visible to all players, for server play? Edit: it may take me a while to add even more waypoints to these intercontinental shipping routes. It also makes the server more laggy. Not only the server will overload for more ships re-routing but giving land for cities to develop for more population is also not good news. I usually leave some tiles away from the coastal area as this happens a lot, but by the look of the land-raise it won't take long until the situation where my routes are also affected (Currently I have 2 routes with land raised waypoints). I should note that, with the new half-heights code and appropriate adjustment to the climate settings to match, much, much less shallow sea is available either for reclamation or long bridges: the sea becomes deeper much nearer the coast than with the current settings. I really suggest marking out your waypoints so that they aren't accidentally paved over. Marking out waypoints is a monumental task, no way I've got the time to do that. As I wrote before, there may be merit in automating the process - if others support the idea I'll start an "extension request" thread?? I've had a lot of waypoints paved over... it's a hassle but I just work around them. What I am doing now (and will do in future games in the shipping era) is put my waypoints in the 2nd level of ocean so that this cannot happen (since this level cannot be raised). I'm doing that too moving forward (but a lot are pre-existing, especially around coastal headlands etc). I'm putting together a train graph for my single track route so I can figure out where the passing loops need to be and plan my service. Please could someone explain the time settings for the server game? I know a train with max. speed 40km/h will cover 40x8 tiles in a "game hour". But how do game hours relate to game months, and game minutes? Reading through this tutorial I should be able to set up a "clockface timetable" but it does rely on understanding how the time system works (bits per month etc). The convoy shift spacing set to 1 gives departures every 06:24:00 (6h24min) or subdivisions thereof (not sure I understand the logic of that figure). I'm fairly sure a single line system can be intensively operated if the loops are in the right place (since simutrans only models absolute block system). With trains of differing speeds, having the speeds an easy multiple of each other (passenger= 2x freight, say) is fairly key too. Any help appreciated. I can break this into a parallel discussion if that helps. Your 40km/h train will cover 320 tiles per game hour, or 5 1/3 tiles per game minute. There are 6h24m per game month, so 384 minutes per month. Therefore the 40km/h train (while maintaining at max speed) will cover 5.333 x 384 = 2048 tiles per game month. You have to account for slowdowns at corners, stations and climbing terrain, so your mileage will vary. Also account for the fact that underground signals aren't available until 1863, so you won't be able to have sidings in your tunnel portions. Also account for the steep climb out of the tunnel network which will be extremely taxing on early locomotives. I plan to use intermittent stations in my underground systems to act as defacto signals until 1863. If you are combining freight and pax/mail on the same line, then your average speed will likely be down around 15-20 km/h (nearly the same speed as ships, at a much higher operating and maintenance cost - you may want to just do pax/mail! ), given that early freight wagons are max 30 km/h and heavy, so locomotives will struggle with a large load up those long hills out of the tunnels. Your optimal convoy spacing will be based upon the length of your longest track section between sidings (or tunnel section with no signals/sidings), how many trains you have operating and their average speeds. You're probably best off constructing it in offline play and finding an acceptable balance. Yeah, that's why I wanted the time data. Excel suggests the return journey is around 23h at 70km/h, plus accel/decel time. My initial plan is 28 block sections of around 250 tiles each, so 14 trains moving in each direction with little delay. It looks possible. I really don't know how much demand there will be at this point but it could easily be multiplied up. If it gets to needing more than 140 trains with 140 block sections of 50 tiles each, I'll double the route. It is very difficult to predict how long that any given coding project will take, and there are several fairly substantial coding projects that will need to be completed before the next major release, including the particularly taxing project relating to city growth, which is still in the planning stage. I am afraid that I cannot give any sensible estimate at all, as I know of no reliable method of making such predictions. Well, I added my ships, which should hopefully be enough. I still need to add some 240 ships to the four long distance lines, but I'll add them as required. It is very difficult to predict how long that any given coding project will take, and there are several fairly substantial coding projects that will need to be completed before the next major release. I've concluded my train-graph exercise. It is technically possible to run a mixed speed service on a single track route very smoothly, but in game it requires great precision of timetabling and waypoints which sounds like a recipe for disaster. The basic logic is that a slow train would travel one block in the same time a fast train travels two, so sometimes two 'up' trains need to overtake, other times an 'up' and a 'down' train need to cross (and sometimes both at once) which is challenging for the signalling. You also need to double the number of blocks to do it. I may play with it further some time, but not on this map. I can imagine that that little ship was launched with great fanfare. I think the waypoint showing after they display no route is the last waypoint it can find between stops, after a few observations, add a few waypoints after it will sort the problem. Yeah... Probably because of it being one of the few named vehicles on the map. I've done so, the route is moving again, but subsequent ships still seemed to be skipping 9 ) in the schedule. Is 9 a waypoint? As described before, convoys automatically advance through the schedule until they reach an actual stop so that they calculate their full route to a stop straight away, rather than to the next waypoint. If the ship keeps going to a waypoint it can't reach, it means that there is a problem in the schedule. 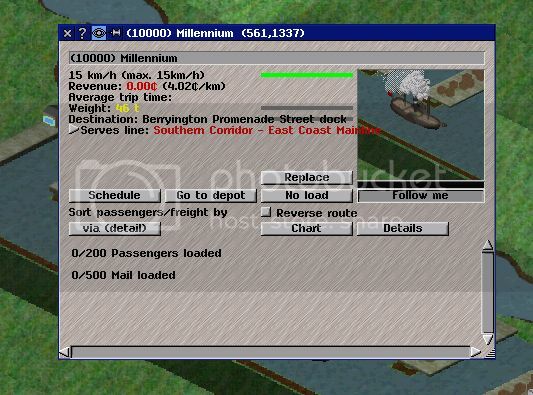 AEO, out of curiosity, I connected your Pondish Seaport to my Bigstable International Dockyards, which connected your Pondish area freight network to my entire map-wide network. I took it offline and sped it up about 8 months and the usage has mushroomed with an intricate spider web of new connections, running both ways. I'm not sure what the longer term permutations of such a huge connection may be (via distribution of profit and logistics), so if you'd like me to disconnect that line, I would be happy to. It may take up to 2 years for everything to establish a new equilibrium. We could connect your Scarden Seaport to my Dashdon dock as well, if we want to explore more interconnections, as well as others. Combining our two freight networks would serve the majority of industrial connections spanning the entire map. The same goes to any other player: if you want to connect to one of my many hubs, on either a supply or demand side, feel free to. I will endeavor to keep up to demand by adding ships as necessary. If a new player wants to earn some really quick profits, just connect any unconnected dairy or cattle farm to one of the international hubs (Farrmouth, Queensingchester, Bigstable, Dashdon, Winterton, Cogsand, Addhead, Yendermouth, Pidmead, Feathervale, Upingpike or Sandton). Or, frankly, any unconnected industry of any type. 9 and 10 are both waypoints (11 probably is too). I may be being dense, but I don't understand why it would skip 9 and not 10. In many cases my ocean lines have 20 or 30 waypoint entries between stops; I don't usually see it skipping all the way through the list 'until they reach an actual stop' which may be 5000 tiles away. Is 9 is redundant if it is being skipped (i.e. maybe it can already find a route to 10 but not to 11)? Waypoints are not actually skipped: the routing is calculated between each waypoint, it is just that this is done consecutively until an actual stop is reached rather than waiting until the convoy arrives at one waypoint before calculating the route to the next. If it stops finding a route at a particular waypoint and then complains that it has no route, this is because it cannot find a route from this waypoint to the next item on the schedule, probably because the distance is too long. The ship can't find a route between 8 and 9, so the schedule will go up to 9, but the real problem is between 8 and 9. You probably need to add a stop or two in between. AFAIK, inside of 500~600 tiles seems to be the limit. The schedule will highlight you the problem, by getting stuck there. The biggest problem I face in those instances is that when I open the schedule to inspect, the schedule will bounce ahead to the next station. You have to make sure to set it back to the next waypoint or else the ship will get stuck. My freight network looks like such, but some of those branches on the islands only feed to the hub or only carry one type of goods. The Bulkports only export bulk and the Axingate Seaport only handles cooled goods. The Seaports mostly handle all, except livestock. Scarden is the hub of hubs. I've been meaning to decommission the Axingate seaport and transfer all of the lines to the Cordish Seaport, but that's where I got lazy. I remember when I was playing an offline savegame you can set the signal to left hand traffic one. But I guess it's not possible to change now does it? Having the signals on the left hand side of the track is indeed a setting, but it will look very odd indeed unless the graphics are also re-drawn (especially for the semaphore signals), so I have left them at the default, right of track setting for the time being. Is it possible to make the server run even without clients connected? I know I am becoming very impatient, but the server might end early anyway, so why not speed things up a bit? Plus the server will be idle instead of shut off when no one's connected anyway. You can start pax rail at 1825/september, although the train will only go at 24~27km/h on straights and 7km/h up hills. The engines are very cheap to run too, so they are not bad to keep around on lesser lines with very few gradient changes. I suggest picking up another game to pass the time.